Hay field foreground, row crop center and far background. 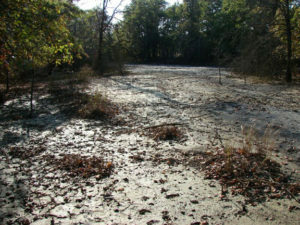 Mostly dry drainage well suited for deer hunting. Just one snapshot. September bow season habitat as seen on a drizzly no wind morning. 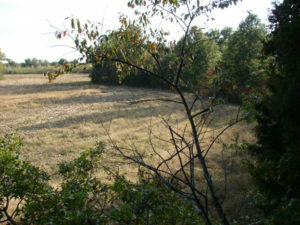 Much of our best deer hunting land has cover habitat found in dry to wet drainage’s. Cutting through grain fields. Connecting many wood patches making for much localized golden nugget spots. Too many. There are more likely spots where deer will be found than there are deer. This drainage is cutting through a grain farm. It is dry most times during a year. With as little as a 1/4 inch of rain it could have water. During wet periods enough water to make it not crossable with knee high boots. maybe not due to water depth. But, due to water and mud depth. 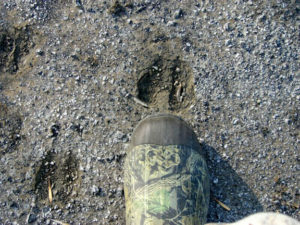 Softer, fine soil retains deer tracks for long periods. An old track, not just from its weathered appearance but also indicated by the hunter’s boot not penetrating the soil surface. A few deer on a habitual pattern will quickly track up a favored crossing spot. These spots while showing deer presence are repeated many times over along any one drainage giving an appearance of a lot of deer in a small area. 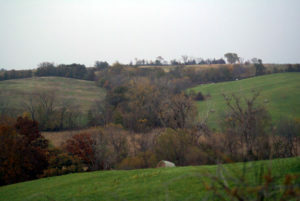 Picking the right favored spot amongst many possibilities on a single farm over several farms is a self guided deer hunter’s million dollar challenge. 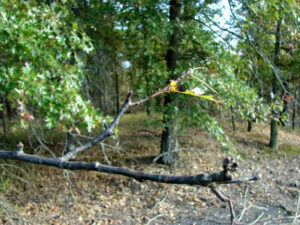 A licking branch scrape at interior edge of a dry drainage. Value is several fold. A drainage creates an interior edge for every exterior edge of a wooded creek line. Two travel corridors. Second value is how lightly wooded it often is along a drainage. Oaks seen in the back ground are common as hickory. Common to a point of diffusing, not concentrating, feeding behavior. This one set pictures shows just some opportunity which exists. Clear evidence of deer activity to include a buck of unknown quality. A self guided hunter challenge is such scouting will find these micro spots at several points along any drainage. Just about every farm will have more than one such drainage. Making for miles of such ground. Exterior edge of this drainage. These pictures were given to us by a first year member. A non-resident deer hunter unfamiliar with our terrain. These are his discoveries. A viewpoint more valuable than what the MAHA staff could present. This is one more attempt to remove all mystery of where to hunt. To develop reasonable expectations. Most deer hunters know Iowa, Kansas and Missouri have trophy whitetail. These pictures begin to show where to find those trophies.